Elnora Karoline Gebert Melber was born to Willie and Bertha Prinz Gebert on October 2, 1911 in the Richland community, Texas. 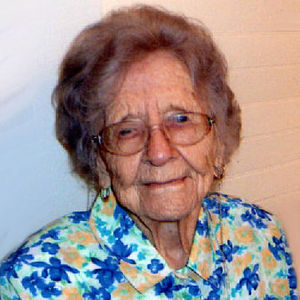 She died at the age of 100 on February 26, 2012 in Granger, Texas. She was baptized and confirmed at St. John's Evangelical Lutheran Church. On December 17, 1930, she married Gus Melber at St. John's in Richland. From this union, five children were born. She worked hard most of her life. As a child, she planted, rolled, and picked cotton. She only went to school on rainy days. With only a 7th grade education, she could name all of the states and capitals, she could name all 18 presidents that served in her lifetime from President Taft to President Obama and many other facts. She was blessed with a tremendous mind that continued until her death. She saw many "firsts" in her 100 years. This included the first car, the first airplane to fly over, her family's first telephone and her first date with Gus in 1928. She was a farmer's wife and full-time mother until she started cooking in the Summit School lunchroom. She planned all of the meals, bought all of the groceries, and did most of the cooking. She continued to cook in various AISD schools for 29 years until her retirement in 1974. She was a wonderful cook and baker. Her family always looked forward to her lemon meringue pie, her homemade honey whole wheat bread, and her delicious divinity at Christmas. She loved all flowers, but especially loved growing beautiful roses in her yard. In recent years, she loved word puzzles, jigsaw puzzles, and playing Chicken Foot, Crazy 8 and Sevens with her great-grandchildren. They all cherished the time spent with her. She spent the last seven years living with her three daughters one month at a time. This arrangement worked well for everyone. She enjoyed a lovely 100th birthday party hosted by her family on October 2, 2011. She had a great time and was a gracious hostess to the many friends and relatives that attended. We all feel so blessed to have celebrated this special day with her. She had a tremendous love for her Lord, followed by love for her family. She always started her day with devotion and prayers for everyone. She was a faithful servant of God. As a charter member of Redeemer Lutheran Church, she joined with a handful of families that started a mission on Anderson Lane in 1954. She continued to worship at Redeemer for 57 ½ years along with other family members of 4 generations. She was a member of The Dorcas Society and Golden-agers. She is preceded in death by her beloved husband of 57 ½ years, Gus Melber, and her oldest son, Wilburn Melber. Also preceding her in death are her brothers, Herbert, Waylon and Leroy, and her sisters, Lorene and Alvina. She is survived by her son, Milton and Teri Melber and her daughters, Nora Lee Birdwell, Junell and LeRoy Paul, and Lillian and Charles Mueller. She is also survived by two sisters, Mildred Melber and Doris Smith and sister-in-law, Hildegarde Gebert, and one 100 year old aunt, Lydia Wolff. She also leaves her precious 14 grandchildren, 31 great-grandchildren, 3 great-great grandchildren, several step great-grandchildren, numerous nieces and nephews, cousins, and brothers and sisters in Christ. Visitation will be held on Tuesday, February 28 from 6 to 8 p.m. at Weed-Corley-Fish Funeral Home located at 3125 North Lamar Blvd in Austin, TX. Funeral services will be on Wednesday, February 29 at 11:00 a.m. at Redeemer Lutheran Church located at 1500 W. Anderson Lane in Austin with Pastors Dave Schroder and Kevin Westergren officiating. Burial will follow at Capital Memorial Park located at 14501 N. IH-35 in Pflugerville. Grandsons will honor their grandmother by serving as pallbearers. They are: Glenn Birdwell, Dale Birdwell, Shawn Melber, John Melber, Daniel Burges, David Robinett, David Belser, and Doug Pettit. Memorial contributions may be sent to the Dorcas Society at Redeemer Lutheran Church, 1500 W. Anderson Lane in Austin, TX 78757. The family wants to thank the medical staff at Seton-Williamson County, Odyssey Hospice, and all family members for the loving care given to her following her stroke on February 10th. A special thank you to Junell and LeRoy Paul and daughters for graciously attending to her in their home during the last week of her life. We will miss you Aunt Elnora. When coming to the family reunion's she alway's remembered who I was. She was a very loving and kind person. Aunt Elnora was a lovely lady and a very dear aunt. I have very fond memories visiting Uncle Gus and Aunt Elnora when I was young. I loved going out to the garden with them and seeing all of your flowers and vegetables they were growing. She will be truly missed in all our lives. Nora Lee invited us (her church Home Group) to have our meeting at her house on September 25th, just a week before Mrs. Melber's 100th birthday. It was an honor and a pleasure to meet Mrs. Melber and to have her participate in the discussions. We celebrated her birthday with singing and cake. Nora Lee and Glenn, may God bless you and your family with peace and comfort and fond memories. Our deepest sympathy on the loss of your dear mom who truly had an amazing journey in Central Texas. Her German roots and traditions coupled with a huge loving family and friends over the last century provided her a unique and joyous life. May God be with you all and provide hope, peace, strength and courage as you say good-bye to your loved one. "Billy" has loved Aunt Elnora since he was a very young boy living with his mom, older brother Jr., and Grandpa and Grandma when Buddy his dad was away in the service. The love of her and all of his many other relatives made it mandatory in his mind to stay in the Richland area every summer till he was a "grown" boy. I have heard so many wonderful stories over and over through the years. Bill absolutely loved being with his grandparents, his MANY aunts and uncles, and, of course his cousins! I first met Aunt Elnora and "the entire family" one Sunday afternoon when Bill and I were dating. Meeting everyone for the first time was awesome and completely overwhelming . . . how in the world would I ever remember all of the names? Through family get-togethers throughout the years I really did come to know everyone's name and who they belonged to. I felt particularly drawn to Aunt Elnora. She had such a beautiful smile and made me feel so at ease with her. She was so easy to talk to and so interested in our family. It just felt so darn good to be near her. Even at the ripe old age of 100 she knew both Bill and me by name and was so cordial at her 100th birthday celebration. It's a day I'll long remember and cherish. What a lady! It's hard to accept that she's no longer among us, but she will always be in our hearts and thoughts. Aunt Elnora, we love you!